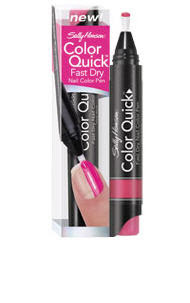 This is certainly not the first nail polish pen, but it certainly is one of the best. -- It claims it's fast drying (it's in the title too) and by gosh, it IS! -- The pen is goof proof, priced right and the shades may not be the most unique, but they are flattering and some even quite fun. I tested this is Sheer Pink first. It was very easy to use. I just clicked on the back end until polish flowed out onto the brush tip (be sure not to overdo it! ), and painted it on. I then clicked the end again when I needed more polish. The back end is translucent, so when I turned the pen over I could see how much polish was left. It dispensed the perfect amount of polish so that I was able to apply to each of my nails quickly. The brush itself may be a bit different for some of you -- it's very short and wide. But this made coverage of my nails very easy. My nails were neat with no mess at all. I found that 1 coat was a little too sheer for me, but two made the color even and very solid. I also loved that there were no brush or streak marks. As I mentioned, this nail polish dries fast. I would say that it really took no more than 1-2 minutes for both of my hands to be completely dry. The finish is semi-shiny and very natural. (If you are looking for a high shine effect, I would try the Sally Hansen Speed Shine top coat on top). The formula had great staying power as well. My manicure lasted 4 full days before I saw any real chipping. For those of you who travel often or need to touch up before meetings or events, this is ideal (they are only about 4"in long) , and the Sheer Bliss is a can't loose, flattering shade of blush pink (it's lighter than the color swatch below) that looks good on all skin tones too! I'm stocking up on these. Available at most major drugstores across the U.S.